Looking for a Used Panamera in your area? CarGurus has 3,360 nationwide Panamera listings starting at $21,991. The Porsche Panamera Turbo may be mankind’s closest experience with invincibility. Introduced in 2010, the Panamera wasn’t surprising for being Porsche’s first-ever sedan. The shock was that a large luxury four-door could perform at the highest levels exhibited by the company’s 911 sports cars. All-new for 2017, the second-gen Panamera takes performance, style, and technology to the next forefront. The Turbo model we drove still has our brain spinning. The first Panamera was not pretty from behind. The hunched, egg-shaped, blobby backside might have been accepted as a Volkswagen or Audi, but from a pristine sports-car maker like Porsche, it felt unfinished and jarring. Among journalists and Porsche engineers, the story goes that then-CEO Wendelin Wiedeking demanded the rear seat accommodate him without his head brushing the roof. So a single 6-foot, 2-inch businessman received his wish, and Porsche’s customers just shrugged and got in the front seat. What you see now is Porsche’s sincere effort to sell a true four-door 911, the sort the company designed nearly 30 years ago with the abandoned 989 concept. The familiar swoop of the roofline doesn’t pretend to hide this car’s poundage. Neither do the tall tail, wide taillights, and massive hood disguise that this is a two-ton-plus machine with acres of room inside. The shape is elegant, expensive, and subtle in the best Porsche tradition. It’s a $100,000 car that disappears when parked, yet exudes a presence, a confidence it can bring quiet destruction to everything on the road. It’s similarly stoic inside, with four bucket seats, a shiny black dashboard with a few knurled metal switches, and big blank screens. The artful exuberance of a Mercedes-Benz E-Class isn’t here. Driving fast is serious business, and while Porsche has given the Panamera giant American-size cupholders in their proper central position, you have to peer deeper and really study this car to find its many comforts. We’ll get to those, but know the Panamera Turbo’s full-leather interior is a feast for the eyes, hands, and nose. Every curve, surface, and stitch is there for a purpose, not your personal amusement. The fun starts when you dare to jam the accelerator to the floor. Our Panamera Turbo owned the streets, all day, all night. The 4.0-liter twin-turbo V8 makes 550 horsepower and 567 pound-feet of torque, routed through an 8-speed dual-clutch automatic and all-wheel drive (AWD). Acceleration is gut-wrenching and nuclear as it decimates slower traffic. Yes, a Tesla Model S P100D can launch from 0 to 60 mph even harder than the Turbo’s 3.0-second time, as recorded by Car and Driver. But over 100 mph, the Model S becomes weak sauce and the Turbo is just getting started. Road friction and air resistance are like a sea wall to fast cars. Not the Turbo, which blows through and keeps charging. Remember the movie “Twister,” in which Helen Hunt outruns a tornado in a Dodge Ram? That was Hollywood nonsense. In a Panamera Turbo, it’s entirely possible. Four driving modes—Normal, Sport, Sport Plus, and a custom Individual mode—vary the throttle, steering, transmission, the firmness and height of the three-way air suspension, plus the four-way rear wing that deploys upward and outward. In Sport Plus mode, stop the car, mash the brake with your left foot and mash the gas with your right. The engine shoots to 5000 rpm. Release the brake, and brace for the violence. We can’t say where we activated launch control, but it happened. Prepare, also, for the quiet, burbling exhaust to sound like a speedboat with straight pipes. Loud isn’t the half of it. During my drive, I forgot to press the button in the middle of the four-way rotary switch that controls the drive modes. This makes the Panamera shift even harder than Sport Plus and activates extra power for up to 20 seconds at a time. Porsche supposes you’ll need it when North Korea launches its rockets. Handling is absolutely unreal for a car that’s almost as long as a Lincoln Continental. The 21-inch summer Pirelli P-Zero tires dig into the pavement, refusing to let any of the car's 4400 pounds disrupt its contact patches. Steering feel is slightly numb compared to Porsche’s sports cars—you won’t notice when the car is riding the edge of its considerable grip—yet it’s quick and nicely weighted. Our car’s optional four-wheel steering tightens its turning radius at low speeds and sharpens response at faster speeds. Body motions were so flat and composed, even without the Panamera’s trick electromechanical anti-roll bars (which can stiffen and loosen in milliseconds) and its torque-vectoring rear axle (which can brake an individual wheel to promote additional yaw rotation). Our Turbo had the stock brakes (carbon ceramics are optional), and they’re strong enough to invoke gag reflexes. Base Panamera and Panamera S models come with rear-wheel drive (RWD). AWD is standard everywhere else. 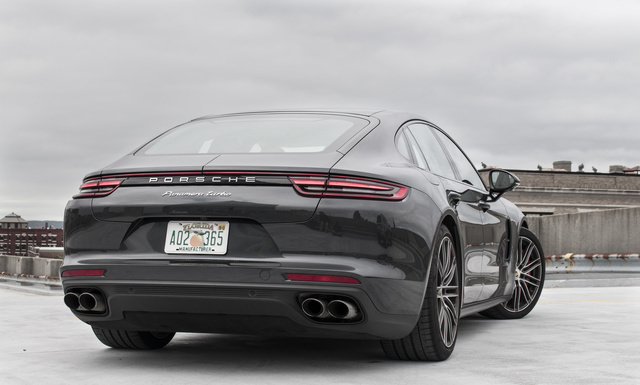 The Panamera and Panamera 4 come with a 3.0-liter single-turbo V6 with 330 horsepower and 331 lb-ft of torque. 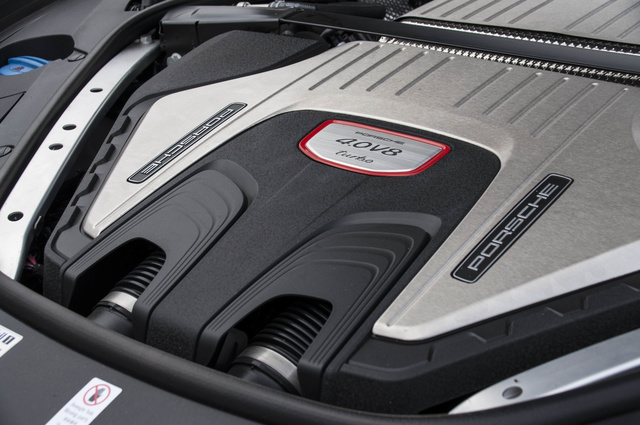 The middleweight Panamera S and 4S offer a 2.9-liter twin-turbo V6 with 440 hp and 405 lb-ft of torque. The Panamera 4 E-Hybrid takes that engine, detunes it back to 330 hp and mates it with a 136-hp electric motor and a 14.1-kWh battery. Total output is 462 hp and 516 lb-ft. The Panamera Turbo S E-Hybrid stuffs that same electrical equipment with our car’s V8, for a total of 680 horsepower and 626 lb-ft. But since that car is several hundred pounds heavier, it’s not any quicker than the non-hybrid Turbo. We did not verify our car’s 190-mph top speed, though our testing suggests Porsche’s claim is accurate. That’s all the lawyers will let us say. Fuel economy is EPA-rated at 18 mpg city and 25 highway. Over 650 miles, we averaged 17 mpg and were disappointed it was so high. 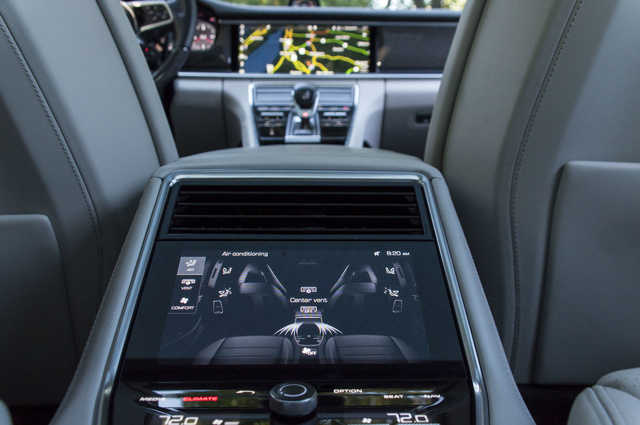 Until now, the Panamera was famous for cramming dozens of buttons and rocker switches onto the center console. Now, many of those functions are behind a 12.3-inch touchscreen that’s fast and logically organized. The center stack still has many controls, but most are touch-sensitive and respond with a bumping sensation. 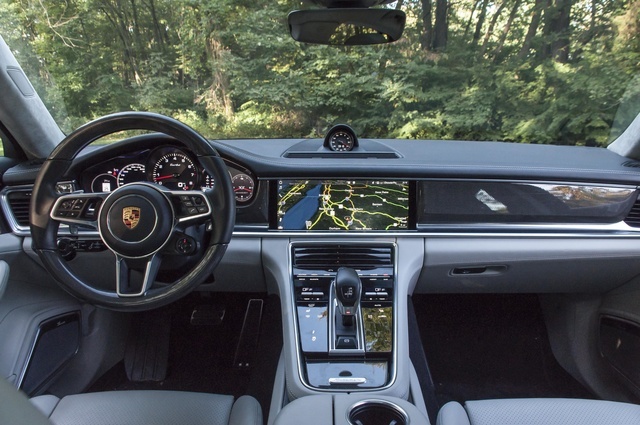 Unlike the similar touch-sensitive dash in some other luxury vehicles, Porsche has made this system responsive and easy to find. Two digital screens flank an analog tachometer. The left display is useless. The analog-style speedometer, in increments of 25 mph, is barely legible and has a “needle” that’s only an inch long. To its left is an area for speed-limit information and temperature. It’s the only space wasted on this dash, as the right display can switch between engine vitals, GPS, G-meter readouts, vehicle warnings, and night vision. A programmable button on the steering wheel can activate the sport exhaust, switch off the engine’s auto stop-start feature, and a variety of other functions. Our gripes involve certain controls, like the central volume switch that’s the only thing not illuminated at night. The cruise control stalk is clunky and difficult to use. And while the old version let you adjust the stereo and start a phone call with the steering-wheel-mounted controls, that’s just not possible anymore. Elsewhere, you’ll find easy adjustments for air conditioning, seat massage, heating, moonroof, and other accessories. Headroom and legroom are generous in all four seating positions, and the rear seats fold down to accommodate a staggering 47.3 cubic feet of cargo. 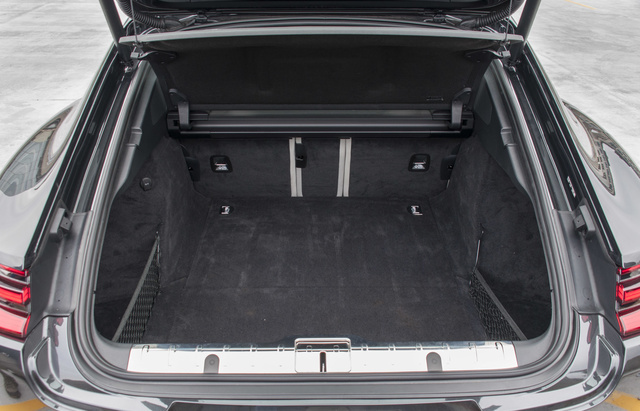 More room is possible with the Executive model, which stretches the body nearly 6 inches. Or the Sport Turismo, an honest-to-God station wagon. 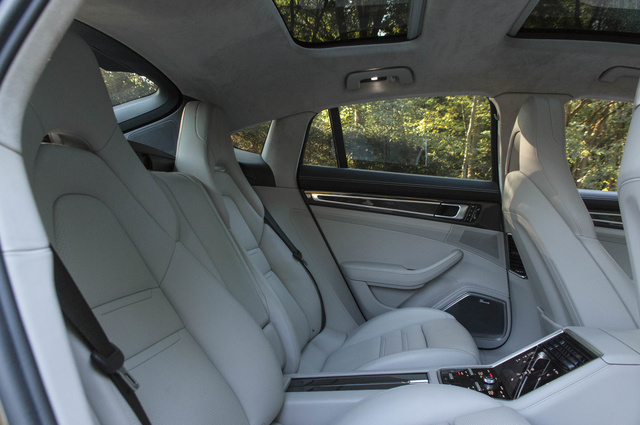 There’s a deceptive amount of space inside a Panamera, and even with that beautiful roof line, the interior environment is cosseting but never cramped. Porsche’s complex technology is buried within the chassis, like those special anti-roll bars that use a secondary 48-volt electrical system. But when it comes to everyday technology, the Panamera hits all the high notes. Apple CarPlay and Android Auto are standard, but the infotainment system is so advanced you won’t need them. Proximity sensors can tell when your hand is near the screen and display additional menu items only when needed. Activating various driver assists or deploying the rear spoiler to show off is simple and presented graphically with 3D models. Rear passengers can set the navigation, which automatically imports your contacts’ addresses and can search for place names and addresses just as easily and quickly as you’d type them into Google Maps on your smartphone. Porsche’s onboard LTE and Wi-Fi allow immediate access to weather, local events, fuel prices, and airport flight times. When using a phone with the Porsche Connect app, you can take a picture and the car will download the photo’s GPS location as a possible navigation route. It’ll input your calendar and route to any destinations saved there, too. Best of all, the car’s entire interface is very fast and intuitive. You’ll never reach for your phone to compensate for a low-res, laggy experience. Trust us that there’s even more beyond the Burmester stereo’s surreal 3D Surround Sound and available Shiatsu back massages that we can cover here in one sitting. If you can think about it, it’s probably here. No government or insurance agency has crash-tested a Porsche Panamera. But you can be sure that this car’s structure—developed by Porsche for use in high-end Bentleys and Audis—is as strong and tough as it gets. Night vision with pedestrian detection, auto-braking, lane-keep assist, and other active safety features are available, but Porsche doesn’t go as far with safety as Mercedes-Benz. Have a look at the 2018 E-Class for the kind of cutting-edge features not found elsewhere. 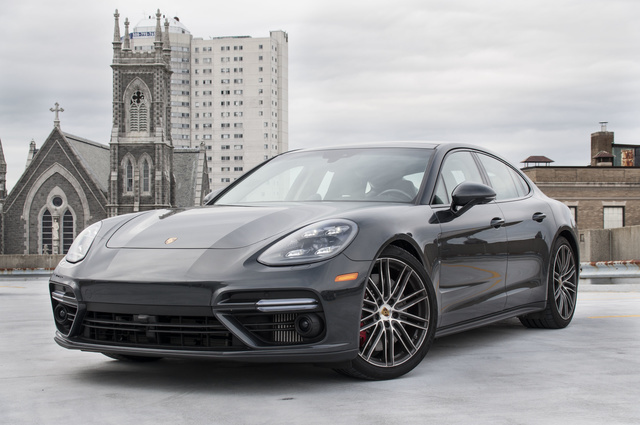 The only reason we didn’t score the Panamera a “1” in this category is because the price buys an exceptional machine that’s engineered to extremes. No car in its class compares, even if the Bentley Flying Spur W12 S can reach 202 mph. Resale value is very strong, although Turbo models like ours take the biggest depreciation hit within the first three years. The only issue is Porsche’s insane option pricing and lack of standard luxury features. It’s very common to see Porsches with 20, 30, or 40 grand worth of extras. It’s also very common to see Porsches keep their value for several years longer than competitive brands. Can you find another luxury sedan that’s fast, stylish, and full of gee-whiz electronics? You can try, but none—absolutely none—drive like a Panamera. Clifford Atiyeh is a reporter and photographer who has spent a good portion of his life driving cars he doesn't own. He is vice president of the New England Motor Press Association and committed to saving both manuals and old Volvos. 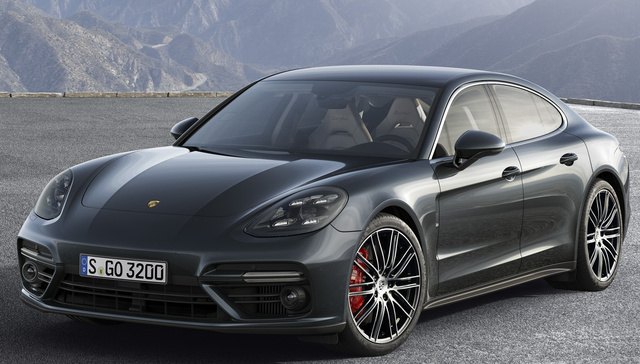 What's your take on the 2017 Porsche Panamera? Have you driven a 2017 Porsche Panamera? There aren't any questions yet. Ask the first question!